It isn’t hard to see the benefits of hitting the gym- exercising makes you healthier, better looking, and it can even help your mental state. The problem is, as I’ve noticed in many recent e-mails to me, many people don’t know how to exercise- and invariably, they end up having lots of trouble getting the results they go after. With that being said, I’ve observed 10 key flaws that most guys have in hitting the gym that hurt more than help, and it’s time to list them out- and tell you how to fix them. In weight lifting and even cardio, form is a lot of the exercise. Performing an exercise to completion as quickly/easily as possible is not the ultimate goal of doing the exercise itself- it is doing the exercise correctly that generates results. 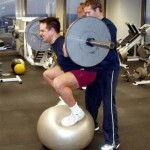 This is a common flaw in weight lifting. Yes, you can probably do a lot of heavy bench presses by lowering the bar halfway down and pushing it back up- but that does very little other than barely develop your triceps. Similarly, doing an exercise as quickly as possible does very little other than tire you out quickly. Proper weight lifting is generally based on your ability to do a full exercise to completion slowly, methodically, and very deliberately, with the full range of motion possible- don’t cheat! The aforementioned “halfway” bench. Don’t do it. The bar should go slowly down to your chest and back up again in a smooth, defined motion. So long as it is safe, try to touch the bar to your chest with each repetition. Squatting, deadlifting, and any other form of complex exercise is especially prone to form degradation, even for pro weight lifters- be careful. Your weekly routine, for weight lifting and cardio, should be based around your ability to balance your energy with your exercise, as well as to hit as many different muscles as possible. Doing the same thing every day (for example, doing nothing but bench presses and curls every day of the week) will not only tire you out quickly, but it will not give you the opportunity to recover. Cardio is not subject to this rule as much, but similarly, balance out your exercising- you run the risk of tiring yourself out and not being able to recover. Doing the same weight lifting routine every time you hit the gym. This is an easy trap to fall into, but avoid doing the same stuff over and over- be varied and find different ways to exercise your entire body. Avoid the folly of doing a muscle-a-day or only exercising some muscles only once a week- try to come up with a happy balance, and utilize compound exercises to hit multiple muscle groups at once. Running the same amount every day. This is okay for training, but it can also wear you out. Prepare times in which you can relax and allow your body to recover. Similarly, vary the type of cardio you do- your body can get overly used to a single exercise, which will lose the effect you usually get from it. This is a major flaw most people avoid. Exercising does not give you carte blanche to eat anything you like- actually, it restricts your diet even more. No matter how hard you hit the gym, going home and eating doughnuts and drinking beer will not make you a healthier person- in fact, it can make you even unhealthier, as your body will weaken as it desperately searches for decent nutrition. Do not focus on one type of exercise to the detriment of the other. Sure, doing nothing but cardio will (ideally) make you a super thin endurance machine, and sure, doing lots of weight lifting will make you massive and strong, but a happy balance is much preferable. No matter how intense your weight lifting routine, try to throw in a little bit of cardio each week to help keep your endurance and general health up. Similarly, no matter how cardio-intensive your workout, hit the gym and build muscle- having extra strength helps in a lot of ways, and unlike what most may predict, it will not “slow you down”. Muscleheads who are too arrogant to hit the cardio machines. These guys are easily identified as having virtually no endurance and being unable to run further than a few steps. Though it is important to avoid running 300 miles when trying to build muscle, these guys could really benefit from some good, sweat-breaking cardio. Many cardio machines also have great settings to firm leg muscles (especially the glutes), which is a great way to augment a lifting routine. Runners who refuse to hit the weights. Weight lifting helps build strength and often will help with speed, and lifting does not hurt your endurance whatsoever. Yes, you could do a single exercise for every single muscle in your body, but should you? No, of course not. Ideally, if you are hitting the weights, the best thing you can do is hit multiple muscles at once, a technique called using compound exercises. Doing this not only allows you to be more efficient, but it also allows your body to train in a more realistic way. As you can probably imagine, big bodybuilders do not spend all day working on each specific muscle (called isolation) like it’s a tiny little baby- they find compound exercises (most notably squats, deadlifts, and bench presses) and use them like madmen. Why work on one muscle when you can work on a ton at once? Of course, all of these in combination play to create one hell of an exercise routine. One of the best phrases I’ve ever heard on this topic is simple: “Squats and Deadlifts are like two incredibly hot women. You’re smart to do one, but you’d be a dumbass not to do both”. ’nuff said. Nothing but machine work. Machines with plates and other forms of resistance are nice, but they oftentimes isolate muscles to your detriment. Free weights often allow for the use of stabilizer muscles, including your core muscles, obviously making you more muscular overall. Nothing but isolation free weight exercises. Look up the exercises you do. Are they hitting multiple muscles? If not, are they absolutely necessary? If the answer to those two questions is “no”, stop doign them and find a routine that uses many muscles at once. This one is simple: if you are not ramping up the work on yourself, you will plateau and not improve at all. This applies to nearly any kind of exercise. If you are weightlifting, gradually increasing the weight is the only way to make your body respond by building muscle. If you are running or doing other forms of cardio, you must run harder, faster, or just generally put more stress upon your body to acclimate to the level of work. No matter what you do, push yourself harder every day– it will pay off. “Being a Bro” is somewhat of a vague term. Allow me to explain. A “bro” is someone who walks into a gym doing nothing but “manly” exercises, flashing his attempt at abs in the mirror, and generally making a jerk of himself. Unless he gets his hands on steroids, he’ll never get any bigger, stronger, or gain any endurance. Why? “Bros”, in my somewhat loose definition, are guys who only do the “hot” exercises- bench presses, curls, and leg lifts. They don’t try to learn more about exercising, they don’t work harder, and they presume they have mastered exercising entirely. Oftentimes, they will do a little bit of cardio (to “burn fat instantly” or something like that), but they will do it in a halfway, lazy sort of manner. I know I’m being cruel here, but the point is, you will not improve unless you are willing to learn and change and improve. Sure, your exercise routine may be good now, but you may have to change it after a while, and you may learn better ways to approach things. Read books about exercising, learn the science behind what you do, and improve your work accordingly. Learning about nutirion, in a similar way, will allow you to truly diet in an efficient and healthy way, instead of a “this diet book told me to do this” sort of way. As cliche as it may sound, be openminded. Bros never learn. Bros are the kinds of people who always do the same old crap, and bite the heads off anyone who do anything different. They may somehow gain a little bit of muscle, but they never really achieve anything truly substantial, all due to arrogance. Do not be these kinds of people, ever. Much better than the earlier article on exercise. Nicely done. I think the headlines for the articles on this site are becoming too lurid. Why not call it: “7 Reasons your workout may be inefficient” or something like that. You should do both, but never at the same time. Cardio will use up too much energy and leave you with smaller muscle/strength gain. Really enjoyed #1. I see these guys at my gym all the time. I like to call them C & A guys (chest and arms) because they always wear warm-up pants and never do any leg exercises.